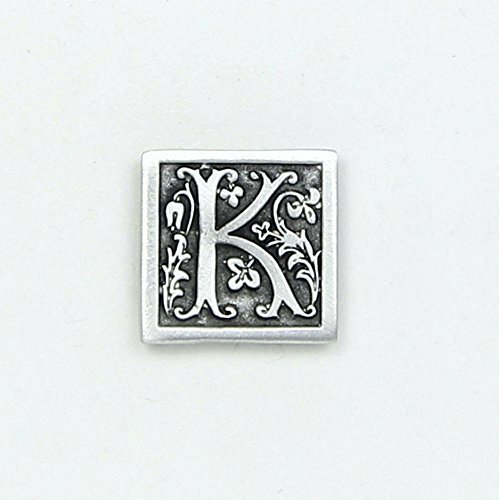 Letter '' K '' Initial Pin - Magnetic Back Closure - No holes in Clothes - Handcrafted Pewter Made in USA - Antique Finished by Lucina K. at Nicky's Blog. Hurry! Limited time offer. Offer valid only while supplies last. Handcrafted pewter front with a magnetic back closure. Decorative and useful to keep scarf in place without putting holes in clothes. Made in USA. Handcrafted pewter front with a magnetic back closure. Decorative and useful to keep scarf in place without putting holes in clothes. Made in USA. Please see photo with ruler for size reference. Pewter Pin is approximately 1" x 1". Initial Scarf Pin is packaged on Card with Artist Bio in Organza Gift Bag as shown. Front of Card reads: " Pewter Scarf Pin - Solid Pewter with Magnetic Backs - Magnets are Very Strong-Slide Backs to Remove "
Back of Card reads: "Handcrafted Made in USA - Handcrafted Pewter with Magnetic Backs - Our products are designed and handmade in our Florida studio and your purchase supports our artists and their families. Enjoy! Lucina K."
Pewter is 100% Lead and Cadmium Free and Manufactured in USA. If you have any questions about this product by Lucina K., contact us by completing and submitting the form below. If you are looking for a specif part number, please include it with your message.